Tess Abrahamson-Richards has more than 8 years of experience in early childhood education and public health. 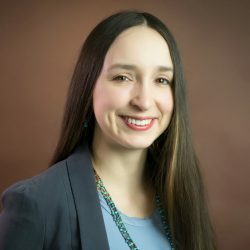 A member of the Spokane Tribe in Washington, she brings to JBA extensive experience working with tribal communities and the organizations serving them. Her areas of expertise include project management, community engagement and outreach, research methodology, community-based participatory research, and research approvals processes. Abrahamson-Richards is the project coordinator for the Multisite Implementation Evaluation of Tribal Home Visiting project. Prior to joining JBA, she worked at the University of Washington, where she served as the coordinator for research studies partnering with tribal communities throughout the United States. Abrahamson-Richards received an M.P.H. in health services with a concentration in maternal and child health from the University of Washington.